The baby, named Giovanna by hospital staff which means 'protected by God', was ripped from her mother's womb due to the impact of the crash in southeast Brazil. Her mother did not survive the crash. Police and social services are reportedly trying to identify the child's dead mother. The driver, Jonathan Ferreira, has been charged with manslaughter. He told rescue crews that he didn't know the woman and was only giving her a lift. 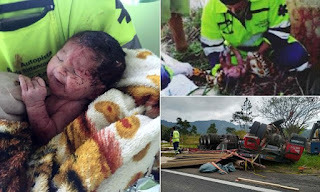 A baby has miraculously survived a horrific road accident that saw her ripped from her mother's womb and thrown on the grass. The heavily pregnant woman was a passenger in a truck carrying planks of wood. The driver lost control and capsized on a motorway near Cajati, between Sao Paulo and Curitiba in southeast Brazil, it was reported yesterday. The girl is now being treated at Pariquera-Acu regional hospital's neonatal intensive care ward. Her mother was 39 weeks pregnant at the time and without any documents. Police and social services are reportedly trying to identify the child's dead mother. They have appealed for relatives of the woman. If none are found, she will be buried as unidentified and the baby girl will be sent to an orphanage and put up for adoption, according to police . Elton Fernando Barbosa, the paramedic who was first on the scene of the accident on the BR-116 highway on Thursday, told Brazil's A Tribuna newspaper that the accident was series. Mr Barbosa said that the driver was seen to by first-aid and he looked for the deceased. He said he found the baby several metres away from the mother, and quickly called for an ambulance to take her to hospital. He even said it was a miracle that the little girl survived.